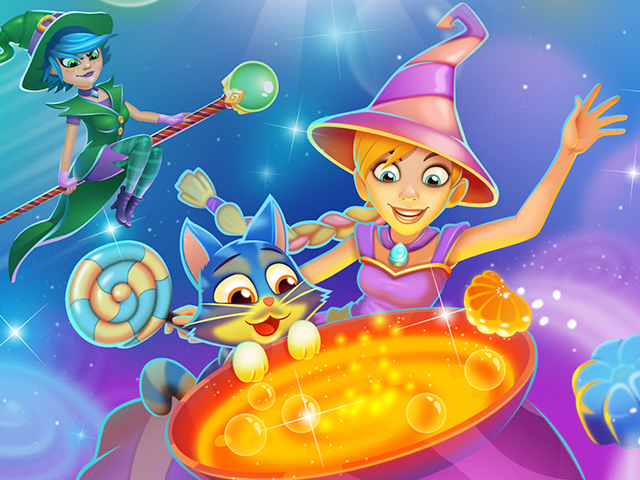 Crafty Candy asks players to help a candy witch named Candice complete match-three levels to create potions. Mobile game developer and publisher Outplay Entertainment has released its newest title mobile devices: Crafty Candy. The match-three game stars Candice, an apprentice candy witch, who must travel through the world of Charmville to improve her skills by creating potions. Each level of Crafty Candy offers a different goal and move limit, and sees players making matches with colorful candy symbols by swapping the locations of two touching candies to create lines of three or more identical symbols. Some stages ask players to collect large numbers of specific candy types, while others challenge gamers to collect truffle symbols by making matches next to them, and so on. In addition to these traditional stages, players will also complete battles against Candice’s sister, Trixie, who tries to prevent players from collecting candy by locking specific symbols behind obstacles. Players can remove these obstacles by matching matches with the locked tiles, and/or making matches next to them, depending on the stage. As players make matches with four or more symbols, or those in special T, L or square shapes, they create power-up candies, which may clear whole rows or columns of symbols from the screen, or trigger explosions clearing all candies in a small area, as examples. Additional power-ups can be purchased before or during a stage, and may add extra moves to the level, or allow players to clear one chosen candy from the board, among other options. Gamers earn up to three stars on each stage, depending on their final score. By logging into Facebook, users can compare their high scores with their friends’ scores. If gamers fail to complete a stage before running out of moves, they lose a life. These recharge automatically over time, can be sent between friends as free gifts, or can be purchased instantly with premium currency. As players clear each level, Candice creates a potion, resulting in an item players can use in the game’s crafting system. These crafting recipes allow players to earn extra lives, power-ups and free premium currency. Outside of the main game, Crafty Candy offers an Apple Watch companion app, which allows players to take care of Cookie, Candice’s cat, to receive prizes for the main game. Crafty Candy is available to download for free on the iTunes App Store and Google Play. In a recent interview with SocialTimes, Douglas Hare, CEO of Outplay Entertainment, talked about the game and its companion app. SocialTimes: With so many match-three games on mobile, how hard is it to create a product that stands out from the crowd? Douglas Hare: It’s true that there a lot of matching games on mobile, but there are huge numbers of games of all genres of games on mobile too. Viewing the sheer number of games in a given genre as a big issue or obstacle would prevent anyone from making anything. We approach every new game we develop with the clear goal of making the best possible game in terms of feel, look, and, most importantly, fun. Where possible, we add as much differentiation as possible, but not at the expense of making the game less accessible or needlessly complex. We believe that Crafty Candy is an exceptionally good match-three game, and are hopeful that players from all over the world will agree. ST: Have you tested the game with players? If so, what were some of the initial reactions to the title? DH: Along with most of the bigger developers we “soft launch” all our games in a small number of countries for testing purposes prior to launching globally. The amount of time in soft launch varies, but in the case of Crafty Candy, the feedback has been so positive that it’s only taken a few weeks. What we’re seeing in terms of retention (how many players come back day after day from when they first play), reviews, engagement, etc. is that players are really loving the look, feel, and fun of Crafty Candy.